“In the right place at the right time” is an old saying that applies to many things in life – which for me, also includes railway photography. Between Footscray and West Footscray stations a constant flow of passenger services run parallel with less frequent freight trains, so getting a photo of the two running side by side takes a bit of luck, and lots of waiting around. The scene pictured above no longer exists – footbridge I was standing up as well as the houses beside the tracks were all demolished in 2011 to make room for the third pair tracks for of Regional Rail Link. But an even luckier shot was this one at Lara, where my planned shot of an Adelaide-bound freight train was photobombed by a departing Geelong-bound V/Line service in the background. 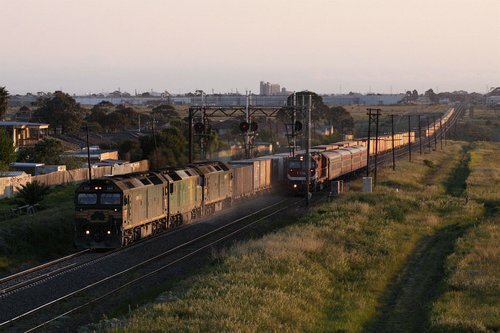 Similar luck gave me this photo of a freight train loaded with steel products at Manor Loop, outside Werribee, overtaken by a much faster V/Line service from Geelong. Another facet of getting a shot is background knowledge. 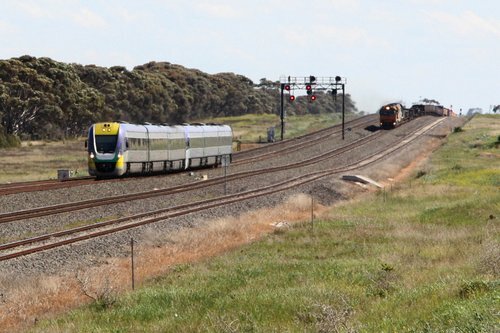 Back in 2015 I headed south of Werribee to capture the last few days of Geelong line V/Line services using the ‘old’ route via the suburban tracks, when a test train on the new Regional Rail Link tracks came past at the right moment, passing over the top. 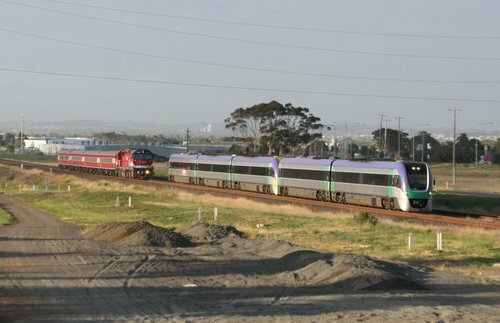 It was during this interim period that V/Line services also continued to use the suburban tracks between Footscray and North Melbourne, resulting in this photo of one V/Line service using the ‘old’ tracks down below, as a second V/Line train used the ‘new’ Regional Rail Link tracks over the top. Knowing that a special train movement is happening makes ‘lucky’ photos easier to capture. 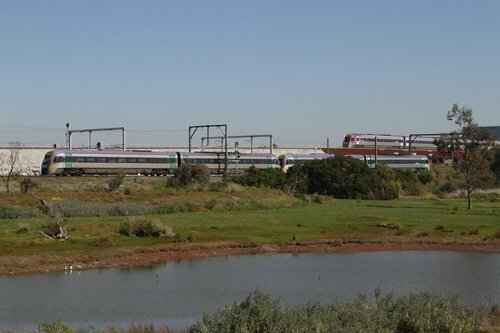 A few years ago I headed out to the usual freight-only tracks linking Albion to Jacana in Melbourne’s west to capture a timetabled diversion of a Shepparton-bound V/Line service, when I got photobombed by a freight train running on the parallel track. 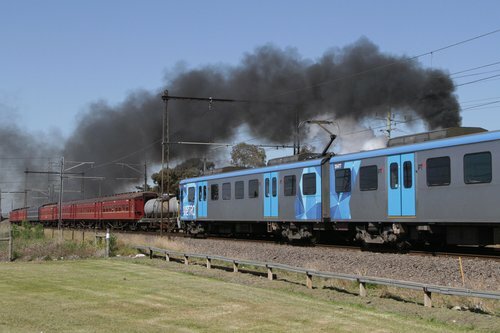 Another tip off lead me to the back blocks of Deer Park to capture a V/Line empty car movement bound for Bacchus Marsh. 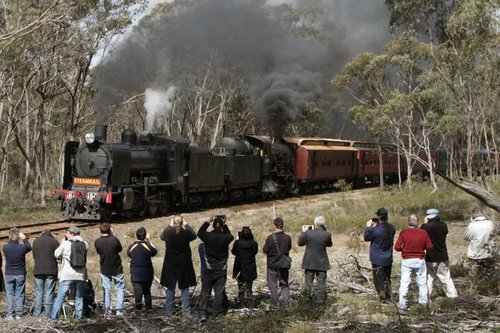 Passenger carrying trains take priority, so my choice of location at the end of the double track was quite fortuitous – a timetabled train to Ballarat overtook the train I had came out to see. But even with knowledge and luck, it takes persistence to get the shot. 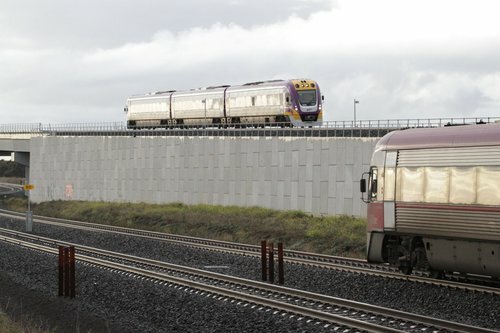 Until 2015 on the Geelong line, two V/Line services would depart Geelong each morning a few minute behind each other. 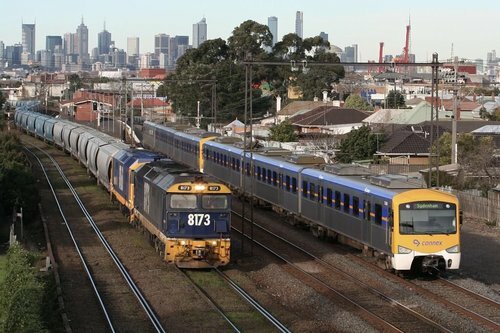 The first train would stop all stations, while the second train would run express to Melbourne, overtaking the slower train. Finding this overtaking point was more art than science – even a 30 second delay to either train could move it a kilometre or so down the line, so all I could do was pick a spot lineside, and hope that I wouldn’t have to come back another day to try again. 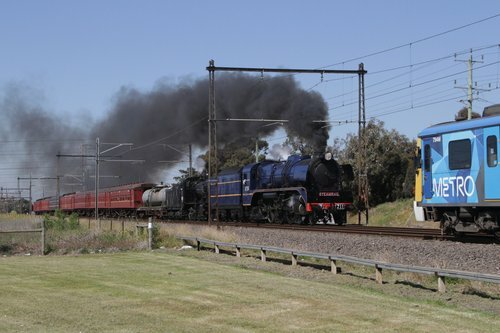 And sometimes my luck runs out, like the time I went out to capture a Bendigo-bound steam train at Ginifer station, and got photobombed by a suburban train on the track in front. Here is a photo from the same location, taken a fraction of a second earlier.